'Snitch' (Thomas Johnson, R. 2009). Seedling# TY161A. SDB, 13" (33 cm), Midseason bloom. Standards medium bluelavender; style arms medium lilac-blue; falls darker rosy-lavender; beards tangerine in throat, light blue at end; slight fragrance. 'Cub Cadet' sibling X 'Microwave' sibling. Mid-America 2009. From Mid-America Garden catalog, 2009: SNITCH (T.Johnson 09) SDB Early Midseason 13” (33cm). Snitch has classy, well-formed flowers displayed on stalks evenly distributed throughout the clump. Ruffled standards are a soft hue of mid blue lavender. Falls are darker rosy lavender. 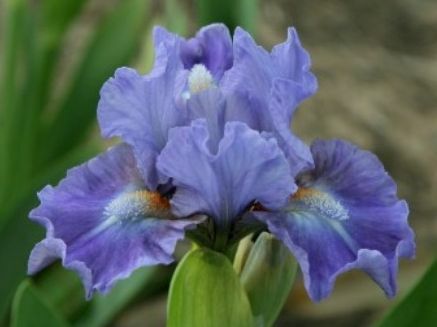 A lovely mid blue flash around pleasant tangerine to light blue beards imparts a serene quality to it.t. Sdlg. TY161A: TU336A - Cub Cadet sib X Microwave. $18.00. jpg IMG_1896-X2_snitch.jpg manage 201 K 12 Feb 2016 - 05:11 BrockHeilman Please contact Brock Heilman for image use.